You are here: Home / Uncategorized / Intesa values: when we’re with you, we’re WITH you. Intesa values: when we’re with you, we’re WITH you. Feel free to share this image on the Interwebs. In the strategic communications field, there’s a difference between a public relations or public affairs rules enforcer, and a true professional partner. In our experience, that difference is usually revealed in work approach and product, ethics, and ultimately, the client experience. We’re present. Take a look around you – from Intern to CEO – and see just how many folks have their noses buried in their phones and tablets. Now, look at Intesa colleagues. We are present. When we’re with you, we’re WITH you. We build confidence in others. Building confidence in our teams and clients takes time and is our most important mission and privilege. From media training and public hearing presentation prep, to project management, digital strategy, and crisis communications– we are transparent in our process and known for our ability to build consensus and confidence. We are delivering work we’re proud of. Be it a memo, letter, PowerPoint, agenda, email, or meeting, Intesa colleagues will not settle for mediocrity. The “love is in the details,” as they say. We’re committed to excellence and professionalism every step of the way. We are leaving clients and the community better than we found them. Our colleagues do our best work to advance issues, causes, and client goals we believe in – from client service, to community service. We are committed to doing good, well. And it’s working. 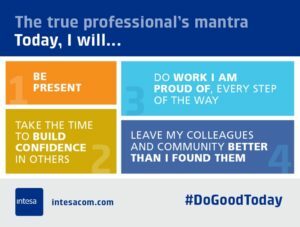 Intesa clients are communicating with confidence, serving the greater good, and helping their employees thrive. Our award-winning team is proud to work along-side them. 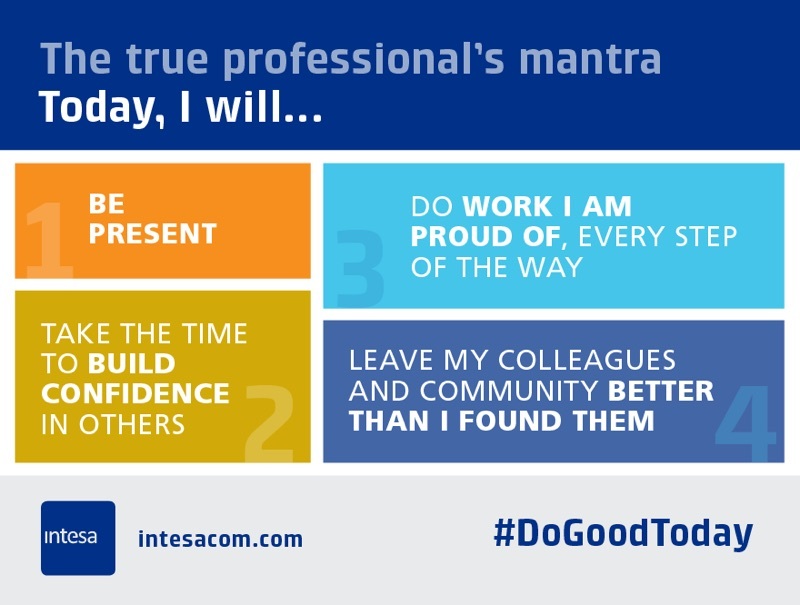 Today, join us in the true professional’s mantra: let’s be present, take the time to build each other up, deliver excellent work, and better our teams, clients, and communities with our actions. The professional, civic, and personal returns are undeniable. Award-winning communicator, writer and project manager with mad karaoke skills. Sign up for our monthly newsletter. We promise to be good stewards of your information and will never spam you. Let us take that off your plate. Call or send us a request via our contact form and we'll get back to you right away!